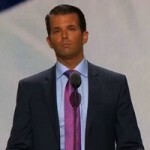 The White House is in disarray following revelations that Donald Trump Jr. supported an effort by the Russian authorities to share information incriminating Hillary Clinton in an attempt to help Trump win the election. On Wednesday, Donald Trump announced that he would nominate Christopher Wray, the former assistant attorney general in the Justice Department during the George W. Bush administration, to be the next FBI director. He is also the former personal attorney for New Jersey Gov. Chris Christie, a Trump ally. Wray’s background is raising questions about his ability to remain impartial as the head of the nation’s premier law enforcement agency. The Mexican government reportedly used an Israeli-made spy software called Pegasus to surveil a team of international investigators dispatched to Mexico to investigate the high-profile disappearance of 43 students in 2014. In a major development that has received little attention, 122 U.N. member states have approved a global treaty to ban the possession and use of nuclear weapons, despite the United States leading the opposition to the treaty.